Antioch Baptist Church’s Deaf Ministry is a revolutionary program that gets more members of the Deaf community in Little Rock involved in worship services. This ministry binds worshipers together and opens the doors for those that may not otherwise be able to worship. This is a safe and inviting place for the Deaf to worship the Lord in an environment where they can be themselves with no restraints. Members of the Deaf Ministry at Antioch Baptist Church gather to worship together. The purposes of the Antioch Baptist Church Deaf Ministry are to: guide people to God’s saving grace, create an intimate and growing relationship, meet together for spiritually vibrant Bible studies and worship services, empower Deaf believers to share the gospel of Christ with others, and train Deaf members to use their talents and abilities to serve others in the Antioch Church family, the community, and throughout the world. 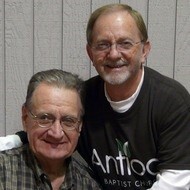 Pastor Bob Slagley with a member of the Deaf Ministry. Members of the Deaf Ministry training to use their talents to serve others. If you are interested in attending or serving within the ministry, you can contact Pastor Slagley through his email at bslagley@antiochmbc.org or give him a call at 501-455-2041 or for the Deaf, you can contact Pastor Slagley through video call at 501-246-8121. If you want to stop by Antioch Baptist Church, they are located at 5300 Stagecoach Rd. Little Rock, AR 72204. If you want more information about the church and would like to attend, the Antioch Baptist Church website is http://antiochmbc.org/home.